The Met Office has been closely monitoring Tropical Storm Leslie during the past week, especially because of the possibility of the impact on Bermuda. It now looks like Leslie will strengthen to Hurricane Force as it tracks 100-150 miles east of Bermuda late on Sunday. Therefore, although around 100 mm of rain and gale force winds are expected, no significant impact is expected across Bermuda, although dangerous rip currents are predicted by the US National Hurricane Centre. 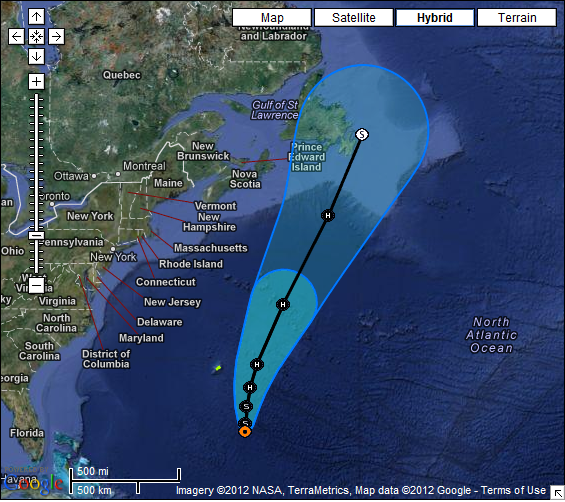 This graphic shows the position and forecast track tropical storm Leslie. The orange circle indicates the current position of the center of the tropical cyclone. The black line and dots show the National Hurricane Center (NHC) forecast track of the center at the times indicated. The dot indicating the forecast center location will be black if the cyclone is forecast to be tropical and will be white with a black outline if the cyclone is forecast to be extratropical. All available forecasts track Hurricane Leslie, and Hurricane Michael, which is situated to the east, quickly north through Monday and Tuesday. Meanwhile, an active cold front which was responsible for the rare New York tornadoes and the high profile disruption to the US Tennis Open Championships will continue to move east from the eastern seaboard of North America. Hurricanes Leslie and Michael and this cold front are expected to converge east of Nova Scotia and south of Newfoundland bringing the risk of 100-200 mm of rainfall to the area through Monday and Tuesday. However the main risk remains to the marine community with wind speeds in excess of 65 knots from late Monday to early Wednesday. Combined with eight metre waves and potentially a maximum wave height of up to 16 metres there will be hazardous sea conditions across the Grand Banks fishing grounds which is the same area as was impacted by the ‘Perfect Storm’ in the Autumn of 1991. Beyond this, the remnants of this combined storm may swing east and push across the Atlantic, influencing the weather over the north east Atlantic toward the end of the week. Currently the area of low pressure is expected to push well to the north of the UK, but will potentially push a frontal south across the UK bringing rain and gale force winds to the north on Thursday and Friday. However there is still a good deal to play for in the forecast for the end of the week and you should keep up to date with the latest weather forecasts and warnings on the Met Office website. Pakistan Monsoon brings exceptionally heavy rain. Elsewhere, the Pakistan Monsoon has brought some exceptionally heavy rain to the region. Khanpur, on or close to the Indus River in Pakistan reported 147mm of rainfall in just 12 hours up to midnight last night UK time. Such heavy and intense rainfall associated with the Indian Monsoon is likely to bring significant and rapid localised flooding issues to this area in the coming days. Across Sindh and Punjab provinces over the last 72 hours stations have been reporting varying 12-hourly totals with anything between 10 and 60 mm at times. Forecasts indicate that rain is expected to continue for another 48-72 hours, with peak intensity over next one to two days. So the situation could worsen initially before events begin to ease off slowly during the early part of next week. This entry was posted in Met Office in the Media and tagged Atlantic Ocean, Bermuda, Hurricane Michael, Indus River, Met Office, monsoon, National Hurricane Center, Pakistan, Tropical Storm Leslie. Bookmark the permalink.